So who was ‘Britain’s greatest foe’? Step forward, Mustafa Kemal Atatürk, Michael Collins, Erwin Rommel, Napoleon Bonaparte and George Washington, who ended up top of an on-line poll conducted by London’s National Army Museum (http://www.nam.ac.uk/exhibitions/online-exhibitions/enemy-commanders-britains-greatest-foes). By the time you read this, one of the five will have been selected at a ‘celebrity speaker event’ at the museum on 14 April. Fighting on Britain’s side were the many Irishmen who enlisted during the First World War. The grand-niece of a war veteran has started a project to collect data on those who survived the war and returned to Ireland. Sabina Purcell plans to complete the project in time for the centenary in 2014. 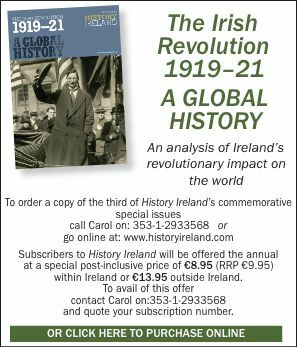 She is looking for information on any man or woman who served in Irish, British or colonial regiments and in any branch of the services. It seems that these survivors are the truly forgotten ones, since there is plenty of information on those who died but, strangely, not on those who survived. If you want to help, write to PO Box 12186, Blackrock, Co. Dublin, or log onto http://www.thereturnedww1.com/. A new venture to translate J.R.R. Tolkien’s The Hobbit into Irish has thrown up an embarrassing fact about this famous Catholic author. It seems that he hated Ireland. He told his friend Prof. George Sayer that the country was ‘naturally evil’. He could feel ‘evil coming up from the earth, from the peat bogs, from the clumps of trees and even from cliffs’. The good news is that the Irish devotion to Catholicism kept this evil at bay. So Fáilte Ireland won’t be using Tolkien to promote tourism, then. No, it is not April Fool’s Day. And yes, our Natural History Museum has removed the horns from its rhinos to prevent them from being stolen. Such horns are worth their weight in gold—well, €60,000 per kilo—to those who believe in traditional Chinese medicine, and you don’t have to be a Freudian to work out why they want rhino horn. Following a spate of thefts across Europe, many museums have taken the precaution of replacing the real horns with replicas. What can we say? It is like the plot of a Dan Brown novel. Relics are being stolen from churches across Ireland. Two crosses may have been returned in County Tipperary but other reliquaries and crosses are still missing. The latest was the theft of the shrine of the heart of St Laurence O’Toole, Dublin’s patron saint, from Christ Church Cathedral. Religious and antiquarian experts all say that they have little or no monetary value. So why are they being stolen? The Vatican has put many of its documents on display for the first time, throwing new light on 1,000 years of European history. ‘Lux in Arcana/The Vatican Secret Archives reveals itself’ is an exhibition in Rome’s Capitoline Museum. Among the remarkable items on display is a letter written on silk from Ming Empress Helena of China to Innocent X, Galileo’s signature, correspondence from Henry VIII of England and records of trials of the Knights Templar. The exhibition runs until the end of September or you can visit http://www.luxinarcana.org/en. Borders are causing problems again. For 200 years the town of Olivenza has been part of Spain, but Portugal claims that Olivença (as it is in Portuguese) ought to be on its side of the border. After the largely forgotten ‘war of the oranges’ (Google it) Spain took over the town. It subsequently banned Portuguese and renamed the streets and squares in Spanish. Opinion in the town is divided. Most are proud of its Portuguese heritage but reuniting with that country is not a priority. To date Spain and Portugal have not fallen out over the matter. The National Library of Ireland has come up with a clever idea for identifying photographs. It has thousands in its archive, and while most places are identified huge numbers of people or events are not. Now the NLI has utilised the photo-sharing website Flickr to get the public’s help. Hundreds of black-and-white photographs from its collection are posted on the site and the public is invited to help identify what’s in them. If you are social-media-savvy, go to http://www.flickr.com/photos/nlireland/. If not, then ask a ten-year-old to help. Progress catches up on us all. After 244 years, Encyclopaedia Britannica will cease production of its iconic multi-volume book sets. Britannica usually prints a new set of the tomes every two years, but the 32-volume set printed in 2010 will be its last. Instead, the company will focus solely on its digital encyclopaedia and education tools. So don’t worry—you can still look up everything from ‘aardvark’ to ‘Zulu’ on-line.